Before I get started, let me extend a special thanks to Dr. Steve Lemke, Provost of New Orleans Baptist Theological Seminary, for his publication of my work at his new blog, “SBC Today.” Dr. Lemke and I have known each other for nearly a year now, and I thank God for the time I’ve known him as well as the hospitality he extended to me while down in New Orleans for the Apologetics Conference this past February 24-25, 2011. Next, I’d also like to give a special thanks to the blog writers at the “Contemporary Calvinist” site; thanks to their question, “exactly what is the John Piper Fallacy?” and the blog link, many individuals found their way to the Center for Theological Studies. I watched for two days, as I saw the stats on my blog climb because of the work of Dr. Lemke and the Contemporary Calvinist writers. Even though I’m convinced that Dr. Lemke disagrees with me on some areas of theology, and the writers of Contemporary Calvinist even more so, I’m thankful to know that those with whom I disagree in some points (others, many) can be cordial and extend some form of kindness. While Calvinists, Molinists, and Arminians disagree theologically (to various extents), we can all recognize at the end of the day that we love the Lord. I can say that Calvinists and Molinists love the Lord. I hope they can say the same about Classic (Reformed) Arminians. Today’s post will begin a response from me to a commenter at the blog, a man named Philip McGoo. First off, thank you, Philip, for commenting and leaving a blog response. 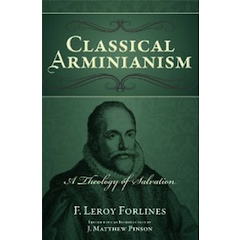 I greatly desire to respond to objections made to Reformed Arminianism, and any time Calvinists write in and respond, it gives me an opportunity to have meaningful dialogue. I don’t desire to be mean, or cruel, or nasty in speech (although sometimes I fail miserably in this desire! ); I wanna talk with Calvinists and come to reason with both them and Molinists from the Scriptures themselves. Since Philip’s response is somewhat packed with a lot to respond to, I will not respond to all of it in this post; nevertheless, I do desire to respond to enough (if not all) of it in a matter of a few days. For those of you who desire to read more of Philip’s comment (and my response), please tune in to CTS this week. “In this state, the Free Will of man towards the True Good is not only wounded, maimed, infirm, bent, and [attenuatum] weakened; but it is also [captivatum] imprisoned, destroyed, and lost: and its powers are not only debilitated and useless unless they be assisted by grace, but it has no powers whatever except such as are excited by Divine grace: For Christ has said, ‘Without me ye can do nothing’” (James Arminius, Disputation XI, “On the Free Will of Man and Its Powers.” Works II: 192). As can clearly be seen from Arminius’ words, he held to divine grace alone as giving life to sinful humanity in salvation. In his “Works,” Arminius also quotes Augustine in his refutation of Pelagius. If you read Arminius’s Works (which can be found online) he also disagreed heavily with Pelagius. But how do the above words of Philip regarding Scripture (even Arminius) lead to unconditional election? What does Philip mean by “unconditional”? Does he mean that God selects certain individuals for salvation? Or does he mean that salvation is “unconditional” because God chooses to give life to unworthy sinners? I agree, as does Arminius, with the latter. If this is what Philip means, then he agrees with both Arminius and myself. If this is not what he means, then he means the former...and this is where I would disagree. All of this is meant to say that God choosing to give life does not necessarily lead to the idea that God only selects some individuals for salvation. To assume that is to argue irresistible grace, a concept that the Scriptures greatly oppose (Acts 7:51). “If therefore ‘Election’ denotes ‘the Decree which is according to election concerning the justification and salvation of believers,’ I say Election is prior to Faith, as being that by which Faith is appointed as the means of obtaining salvation. But if it signifies ‘the Decree by which God determines to bestow salvation on some one,’ then Faith foreseen is prior to Election. For as believers alone are saved, so only believers are predestinated to salvation. But the Scriptures alone know no Election, by which God precisely and absolutely has determined to save any one without having first considered him as a believer: for such an Election would be at variance with the Decree by which he hath determined to save none but believers” (James Arminius, “Nine Questions,” Works II: 64). Does Philip define unconditional election as the latter, the election by which God selects some for salvation apart from faith? If he does, then both Arminius and I would disagree. As Arminius notes well, “as believers alone are saved, so only believers are predestinated to salvation.” Never in Scripture do we find that anyone is “predestined to believe”---and yet, Calvinists would have to prove that individuals are predestined to believe if they desire to make their case for unconditional election. God alone gives life; Philip, Arminius, and I agree. But where we disagree concerns to whom God desires to give life. I agree that God desires to give life to all persons, since He died for the world (John 3:16) and desires that “all men be saved and come to the knowledge of the truth” (1 Tim. 2:4). Scripture itself is why I believe that Reformed Arminianism is the most biblically faithful theology of our time. I will respond to more of Philip’s comment in the days to come. God bless.